Flash player is either not detected or outdated. please click here to download the latest flash plugin. 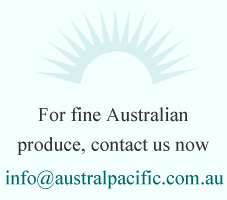 Austral Pacific Exports is a Western Australian based company specialising in the export of premium Australian meats, fresh fruits & vegetables and processed foods. The company exports the best Australian food brands, providing its clients with the finest quality products. Austral Pacific Exports is a worldwide exporter that currently supplies food products to various regions including Europe, Asia, Middle East, Africa, Mauritius and the Pacific. The company is interested in further extending its exports into new areas of the globe. As Austral Pacific Exports offer such a diverse range of products, it provides customers with the opportunity to do all their purchasing as a ‘one stop shop’. The company offers customised orders which provide clients with the freedom to select the combination of products they require. The company prides itself on prompt, reliable service and delivery, and most importantly assures its clients they are receiving the best Australia has to offer.